Rich Belgian Callebaut chocolate, sweet Vermont cream, 100% pure Vermont maple syrup, and raspberry, hazelnut, pistachio and champagne ganaches. Fall in Love with Lake Champlain Chocolates! St. Valentine must be smiling on ya, ‘cause you have received a yummy selection from one of our favorite U.S. chocolatiers. The New York Times has lauded Lake Champlain Chocolates as the creator of “some of the best chocolate in the country.” They’ve received numerous industry awards, including the prestigious “Epicurean Award for Top Choice Chocolates” conferred by the American Institute of Wine & Food. One of the characteristics that makes Lake Champlain Chocolate products so good is their use of Vermont’s natural resources—dairy products and maple syrup. The chocolates are a wonderful meld of pure rich Belgian Callebaut chocolate, sweet Vermont cream, and butter, sometimes blended with 100% pure Vermont maple syrup. 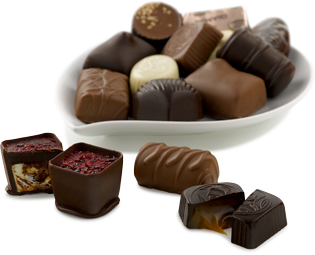 To ensure exceptional freshness, all Lake Champlain chocolates are made in small batches. Your collection includes fifteen delicious chocolates and a five-course sampling of exotic truffles. Prepare for a carnival of flavors, including the original Chocolates of Vermont flavors: Raspberry Cream, Hazelnut Praline, and heavenly Pistachio Cream. 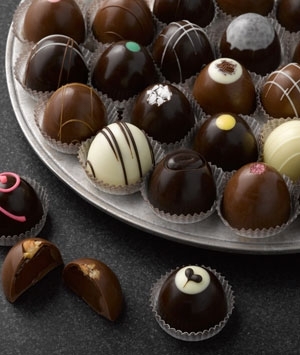 As if that weren't exhilarating enough, the chocolate gurus at Lake Champlain have created Champagne, French Roast, Vanilla Malt, and a special Dark and White Chocolate Raspberry Ganache to fill your truffles! Negative Feedback has a Positively Delicious Outcome! Sometimes risks really pay off, and that's just what happened in the case of Vermont's world-renowned Lake Champlain Chocolate Company. It all started twenty years ago with Jim Lampman, restaurateur and owner of the acclaimed Ice House Restaurant in Burlington, Vermont. Apparently Jim was a thoughtful boss because he would periodically purchase expensive boxes of chocolates as gifts for his staff. Like many of us have done in the past, Jim figured if he paid enough for his boxed confections, they had to be quality chocolates. As we've all learned, much to our chagrin, that rule of thumb isn't always reliable. One day after receiving one box too many, Jim’s pastry chef, a man of unsullied culinary acumen, took him aside and said, "These chocolates are terrible!” Jim then dared the man, "All right, you do better!" Shortly thereafter, his pastry chef made good on the dare and presented Jim with the finest chocolates he had ever tasted. Jim was in chocolate heaven and his life would never be quite the same. It wasn't long before the Ice House Restaurant began serving hand-rolled, distinctively flavored truffles to their appreciative restaurant patrons. The response was so overwhelming that Jim established a separate, upscale confection business. The intent was to create them for his restaurant customers and other wholesalers… but word spread. No matter that the business was located in a tiny, unwelcoming alley; retail customers found them. Raves about the heavenly chocolates spread far and wide until eventually Jim sold his restaurant to devote his full attention to Lake Champlain Chocolates. These days, the team on the shores of Lake Champlain has grown to 100 or so employees, who support and uphold the highest standards of chocolate making. Of course, they use only the freshest ingredients and the very best chocolate, but what truly sets them apart, is their heritage of fine craftsmanship and creativity. Add to the mix the wonderful flavors of Vermont’s natural resources, and you have a true recipe for success. There are no preservatives, extenders, or additives in Lake Champlain Chocolates. They’re certified Kosher, and each of their chocolates is made in small batches to ensure exceptional freshness. * In 2000, Lake Champlain Chocolates was awarded the prestigious Epicurean Award for Top Choice Chocolates by the American Institute of Wine & Food. * In 1998, Lake Champlain Chocolates' Hazelnut Five Star Bar won the "Outstanding Confection" award by the National Association for the Specialty Food Trade at the annual summer International Fancy Food Show in New York City. * The Five Star Bar line was a finalist in this same competition in 1996 and voted Best New Bar of 1989 by the Candy Bar Gazebo. It was also named “The Ultimate Chocolate Bar” by Vogue magazine in 1993 and 1990, both prestigious accolades for any Chocolatier. * Other awards reflect the wide range of quality and workmanship in every facet of their chocolate making process - The Burlington Free Press Reader's Choice Awards in 1999 (and consecutively since 1993). Also, Lake Champlain Chocolates was voted "Favorite Chocolate" by the Albany NY Times Union newspaper in 1999, and their chocolate factory was selected as the "Editor's Pick" for an outstanding reason to visit New England by Yankee Magazine's Travel Guide in 1999. In 1763, England was granted what is today known as the Vermont territory through the Treaty of Paris, which ended the French and Indian War. Ethan Allen and company soon moved in and ended all land ownership disputes with New York and New Hampshire. Vermont was officially adopted as the new republic's name on June 30, 1777, yet there are at least two different stories told to explain its origin. The first stems from a story told by Dr. Samuel Peters, which most historians feel is invented. In truth, the name Vermont probably was given by another doctor. Dr. Thomas Young was a Pennsylvania statesman who took a great deal of interest in the young republic in the mountains. It was he who had suggested that Pennsylvania's constitution be used as the basis for Vermont's, and this was, in fact, what was done. He is also credited by many authorities with having suggested the name Vermont to perpetuate the memory of the Green Mountain Boys, who were named for the long north-south ridge of mountains that nearly bisects the state. (Vert is green in French; montes mean mountains.) Before joining the United States in 1791 as its fourteenth state, Vermont remained an independent republic, and to this day Vermonters remain fiercely independent in spirit. A piece of trivia for you: when was the first census in which the state of Vermont had more people than cows? Answer: 1960—and the pastoral state still has a sizeable bovine population. Burlington, where Lake Champlain Chocolates is located, is—with just under 39,000 inhabitants—Vermont’s largest city. It’s also touted as one of America's most livable cities. It’s situated on the eastern shore of Lake Champlain, nestled between the Adirondack and Green Mountains. In addition to the University of Vermont, Burlington is home to the world-famous Vermont Teddy Bear Company, Ben and Jerry's, and The Shelburne Farm, which makes some of the finest handcrafted cheeses in America. (Not surprisingly, we have featured them in our Gourmet Cheese Club.) The Shelburne Museum, including 39 New England style buildings on 45 acres, is dedicated to New England life and its artisans. In fact, much of Vermont's business dollar relies on cottage industries that make a host of products ranging from knitwear, quilts, weather vanes, and decoys to hand-blown glass and hand-thrown pottery. Vermont culture is unique, and its scenic landscapes are well worth a visit in any of its four distinctive seasons. If you ever do, consider a tour of Lake Champlain Chocolates. Or take a virtual tour of the area. Go to www.vpike.com and plug in their address: 750 Pine Street, Burlington, VT, 05401. Solid chocolates and filled chocolates represent entirely different culinary philosophies and thus, should not be savored in the same way. Solid chocolate should be taken in small pieces, put on the tongue, and left to melt. On the one hand, this allows for the taster to see if the flavors release themselves naturally and in a well-balanced, complex manner, and on the other hand, to see if it really melts. If the chocolate is not "balanced" it will not melt; this can be caused by not having enough cocoa butter. Afterwards, the chocolate should be lightly passed between the tongue and the palate to ascertain if it has been sufficiently ground to give it a fine texture (the palate and the tongue can feel from 60 microns, but no finer). In Belgium, chocolate is ground down to 30, even 20 microns to be certain that no grains can be felt. In contrast, a filled chocolate should be bitten into several times so that the chocolate shell is mixed with the interior filling, thus making it possible to appreciate the balance that the chocolate maker has tried to create. Like fine wines, chocolates should be stored in a cool, dry, and dark area. Since chocolate is highly susceptible to absorbing odors, your chocolates should be kept away from other strongly fragrant foods. Optimally, you should store your chocolates at 59° to 65° F (15° to 18 °C), and under 65% humidity. If you keep them in an ambient temperature below 72°F (21°C), there is no need to refrigerate your chocolates if they can be eaten within three weeks – and let's face it; these chocolates will most likely be eaten within the first few days! Hide them somewhere safe if you want to get a chance to try all the flavors! So what are you waiting for? Easter and other springtime celebrations are just around the corner. Why not follow Jim’s example and enrich the lives of your employees (or family and friends) by gifting them a Gourmet Chocolate of the Month Club membership? Or consider one of our other five gourmet clubs of the month. MonthlyClubs.com offers many creative options. Call 800-625-8238 for more information.